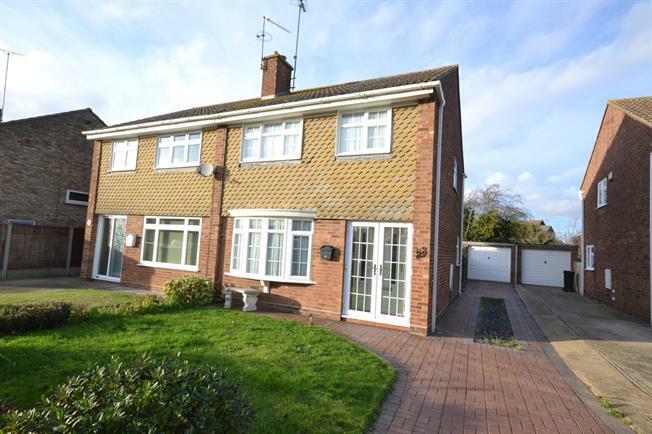 3 Bedroom Semi Detached House For Sale in Burnham-on-Crouch for Offers in excess of £275,000. Being offered with NO ONWARD CHAIN, is this three bedroom semi detached house in a popular location. The ground floor accommodation comprises of a spacious through lounge/diner opening onto a sun room overlooking the garden, and a fitted kitchen. The first floor is home to three bedrooms, two of which are doubles and a family bathroom & WC. Externally the property features a landscaped rear garden with access into the detached garage and a driveway to the side with parking for multiple vehicles. Tiled flooring, double glazed uPVC window, patio door opening to the garden, range of matching base and eye level units, roll edge work surface, inset ceramic sink, ceramic hob with extractor above, washing machine( to be fitted), space for fridge freezer.